Professionally fitted conservatory blinds can completely transform your conservatory into a welcoming, useable room all year round. 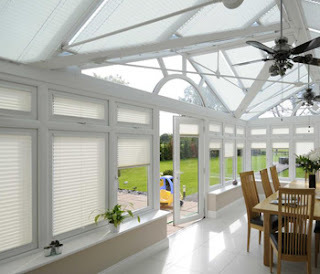 But conservatory blinds not only help keep your conservatory cooler in summer; they also offer privacy, reduce glare and prevent UV from fading your furniture. 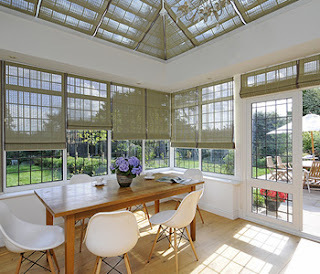 Pleated conservatory blinds are the most popular choice because they can often be recess-fitted right up to glass. Not only do they tend to provide the neatest fit, but they are perfect for virtually all conservatory styles and shapes. Surprisingly, there are many different types of pleated blinds available, with varying quality and suitability for conservatories. Unique Pure™ pleated blinds have been specifically designed for UK conservatories, how ever complex the shapes and no matter how narrow or wide the windows. High-performance Solar Design™ fabrics are suitable for all conservatories, including those with the latest solar glazing, to provide optimum protection from UV, glare and heat gain. This way you can maintain the natural light that your conservatory offers, whilst still creating a much more comfortable environment. Pinoleum blinds are made from real wood and are therefore most popular in timber conservatories. They gently filter the light to create a soft dappled shade, to create a truly inviting atmosphere. Available with optional solar lining, they can provide the ultimate in appearance and performance, whilst maintaining a light and airy feel. Conservatory styles and shapes vary tremendously, so it is vital that you find a conservatory blind specialist and obtain comparison quotations to ensure that your blinds are effective for your needs.